The former Republican Speaker discussed 2012 during a recent speech at a Missouri college. (CNN) - Former House speaker Newt Gingrich is warning of a third party mutiny in 2012 if Republicans don’t figure out a way to shape up. “If the Republicans can’t break out of being the right wing party of big government, then I think you would see a third party movement in 2012,” Gingrich said Tuesday. The speech, to a group of students at the College of the Ozarks in Missouri, was recorded by Springfield TV station KY3. But Gingrich, bemoaning President Barack Obama’s “monstrosity of a budget,” acknowledged that Republicans are partially to blame for the escalation in federal spending. 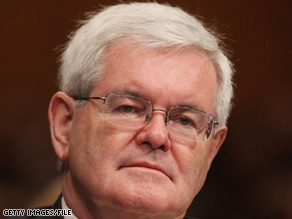 Gingrich has repeatedly said that he will decide in early 2011 whether he plans to seek the White House in 2012. The Republican Party is done as we know it. Come on third and/or fourth party. There's room in the country for you now. As a social liberal and a fiscal consevative I would like to see Newt run as a third party. I think he is right, not that I agree with all of his views, but currently we have to pick the lessor of two evils. I voted for Obama, but he is going way to far to the left on tax and spend. (Hillary would have been better, Romney would have been the best). I think we should focus on education and getting the economy back on track. Social issues such as gay marriage should not be a goverment issue. Sorry, there is no sanctity of marriage everyone gets divorced. Healthcare should be a second term goal, same with the tax increase. We need to see what we can cut before we go off and raise taxes. Essentially I want a party that stays out of my wallet and out of my bedroom. There are many of us Republicans out here who have been very unhappy with our party and wish to see either some serious reform or a viable third party evolve. Right now, there is no one in the Republican leadership that excites me, and I sure as heck don't agree with the Democrat's big government philosophies. We've gotten to the point where the most capable and qualified won't run becuase of the circus our election process has become. It's true that the spending is big, budget is huge, the deficits will be bigger. All money is from public fund to spend. All are true. But American economy is huge, to fillup the holes and dents caused by greed yiu need a huge budget too. After all, if you look in a different perspective, all money belongs to public, will be used for the welfare of public. Nothing wrong with that !!! Mr. Gingrich, you too are talking about huge spending by this government and you too have not proposed an alternative like your colleagues who are saying the same.